“I think the administration has had a one-eyed policy on this,” Salman Shaikh, founder and CEO of regional consultancy the Shaikh Group, told AFP. Shaikh said he and others had warned US officials “at the highest level” that its focus on Iran had hurt its traditionally warm relationship with Riyadh. “As a result we’re now seeing a fairly serious balance of power struggle being played out between the two main protagonists in the region,” he said. Secretary of State John Kerry called senior Iranian and Saudi counterparts on Monday to seek to deescalate the crisis that came to a head when Riyadh marked the New Year by executing a respected Shiite cleric. “We hope it’s not irreparable,” State Department spokesman John Kirby said, of Riyadh’s decision to cut diplomatic ties with Tehran. But Shaikh said that Washington may have little power to redress the situation. “Now I think the amount of US influence and leverage on this situation is alarmingly limited at this point in time,” he warned. The Middle East’s two pivotal Muslim powers — the Sunni kingdom of Saudi Arabia and the Shiite Islamic republic of Iran — have never seen eye-to-eye. Riyadh accuses Tehran of stirring sedition among the Shiite minorities in Arab states, while Iran sees its rival as a US proxy and sponsor of extremism. Washington broke off diplomatic relations with Iran after the 1979 hostage crisis at its Tehran embassy and has remained a close friend of Saudi Arabia. But there has been mounting anger in Riyadh in recent years as Washington has reached out to Iran in order to secure an agreement on its nuclear future. This appeared to bear fruit in July last year, when Tehran agreed to measures to put a nuclear weapon beyond its reach in exchange for sanctions relief. Kerry publicly insists the nuclear deal was a self-contained effort, but it was widely seen as a step towards a better working relationship with Iran. This has infuriated Riyadh and Saudi allies in the Gulf, who see Iran’s hand behind militant attacks, Shiite unrest and the Huthi rebellion in Syria. Washington has side-stepped their concerns and — with Russia — has worked to bring Iran on board as a “stakeholder” in efforts to end the Syrian war. Last week it was Saudi Arabia’s turn to ignore US warnings, when it marked the first day of 2016 with a mass execution, including of a leading Shiite cleric. 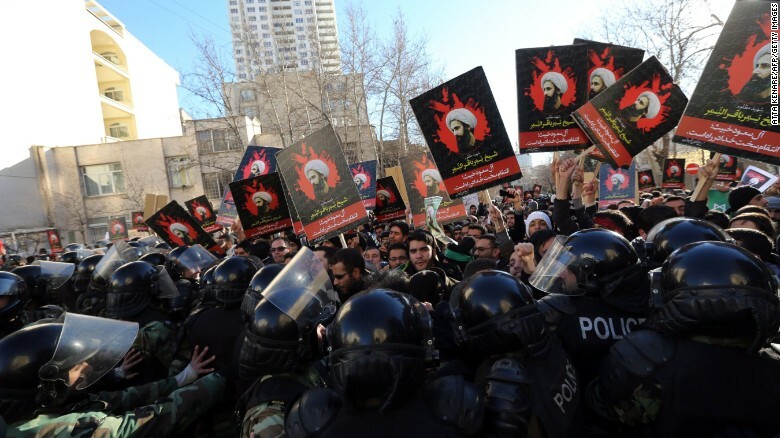 Sheikh Nimr al-Nimr’s death was seized upon by Iranian hardliners and at the weekend local authorities stood by as protesters stormed the Saudi embassy. The State Department condemned the attack on the embassy, but also reiterated what it said were its concerns about the Saudi judicial process. “We continue to call on the government of Saudi Arabia to respect and protect human rights and to permit the peaceful expression of dissent,” Kirby said. Saudi Arabia and some of its Sunni allies have cut off ties with Iran and US rival President Vladimir Putin of Russia is offering to play mediator. Alberto Fernandez, a former US ambassador now with the Middle East Media Research Institute, said the crisis proved the US administration’s critics right. “How can you warm up with Iran without upsetting your ally?” he asked, pointing to Iran’s aggressive role in other problem areas around the Middle East. “Those who said that you cannot divorce the nuclear deal from Iran’s other activities in the region were right,” he told AFP. Kerry would reject this criticism. His spokesman Kirby insisted that in pursuing a nuclear deal to make the world safer, the US had not given Iran a pass. “Nobody is a turning a blind eye to the capability of the regime in Tehran to further conduct destabilizing activities in the region,” he said. Whatever Washington’s next move is — beyond appealing for calm — the diplomatic crisis could last for years and feed into others, jeopardizing the Syrian talks. The United States still hopes UN-mediated negotiations will go ahead later this month as planned, but the already slim prospects for a rapid peace have dimmed.